Doctor Who TV show on BBC America and BBC One. 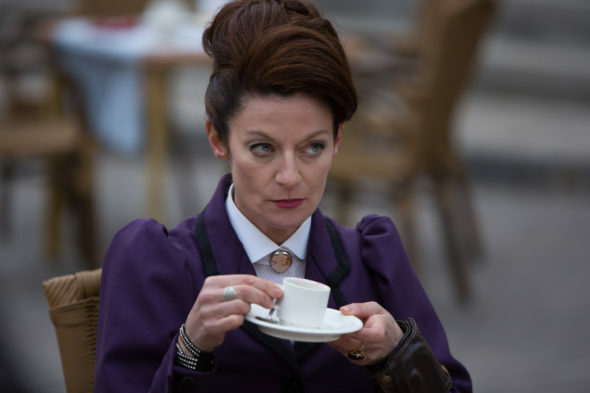 Michelle Gomez returns to Doctor Who, season 10, as Missy. Simon Ridgway, © BBC WORLDWIDE LIMITED. Michelle Gomez has confirmed she will return as Missy, to the upcoming 10th season of the Doctor Who TV show on BBC America and BBC One. Gomez appeared in the first season of The Brink TV show, which was cancelled after one season on HBO, after the premium cabler had renewed it for a second. Gomez broke the news at at MegaCon 2016, in Orlando, Florida. As Missy, Gomez plays the newest iteration of the Doctor’s arch-enemy, The Master. Missy is not to be taken at her word. We’re confident Gomez was speaking for herself, though. The actress joins Peter Capaldi’s Doctor, and the newest companion, played by Pearl Mackie. Season 10 of Doctor Who will premiere on BBC America in 2017. Here’s the tweet from Doctor Who News, publicizing Gomez’s announcement. Watch the introduction of Michelle Gomez as Missy, in Doctor Who, “Dark Water,” season eight, episode 11. What do you think? Are you getting excited for the tenth season of the Doctor Who TV series? How do you feel about Missy’s return?